CALIFORNIA DANE (AUS) (Bay 2002-Stud 2007). 6 wins to 1200m, MVRC Schweppes S., Gr.2. Sire of 117 rnrs, 82 wnrs, inc. SW Platinum Witness (New Zealand One Thousand Guineas, Gr.1), Rebel Dane, Eclair Choice, Fire Thunderbolt, Lake Sententia, SP I'm No Phony, Ghost Street, Sunshine Spirit and of California Wish, Californian Jet, Californian Man, Way We Go, Calianco, Clemo, Inspector, Skarsgard, The Wesleyan, Bandit Queen, California Dude, etc. The Monstar (g. by California Dane). 7 wins. See below. Miss Twoicee (f. by French Deputy). 2 wins at 1000m, 1200m, 2d MRC Caranna H., Figure H.
Usain Dane (c. by California Dane). Winner at 1200m in 2014-15, 3d VRC Union Road Community Hub 3YO Trophy. Bose (g. by Flying Spur). 3 wins at 1200m, 1400m in Aust. Solvang Mist (f. by California Dane). Winner at 1100m in Aust. All Misty (f. by Falbrav). Winner at 1400m in Aust. Katie's Cove (Zabeel). 2 wins at 1200m, 1400m, 2d Hawkesbury Guineas, Gr.3. Sitara (More Than Ready). 5 wins-1 at 2-at 1200m, NZ$113,190, Manawatu RC Capture Signs H., Rangitikei RC McVerry Crawford Mitsubishi Hyundai H., ARC Comfort Zone H., 2d CJC Great Easter H., L, Hawke's Bay Ocean Park at Waikato Stud H., Little Avondale Per Incanto H., ARC More FM H., Rennells Jewellers H., Telecom H., Manawatu RC Rich Hill Stud H., Te Aroha JC CRV Ambreed NZ Ltd H., 3d Taranaki RC Schweppervescence Sprint H.
Market Maestro - I Am Famous (Mac.). 9 wins from 1050m to 1700m in Aust. and Macau, Macau Star of the Sand S., Anshan H., Albury H., Montrose H., Carlisle H., Peterborough H., 2d Macau Oxford H., Clonmel H., Bradford H., 3d Macau Ayr H.
Mighty Stormy. 5 wins to 1400m, STC Lapstone H., 2d STC Como H., Surry Hills H., 3d STC Londonderry H., Glebe H., Cooks River H., Ashbury H.
ALL OUR MOB (What a Guest). Joint third on The 1996-97 Australasian 4YO+ Classification (1000m-1400m). 13 wins-1 at 2-from 1100m to 2000m, A$2,580,750, HK$120,000, AJC All-Aged S., Gr.1, VRC LKS Mackinnon S., Gr.1, Newmarket H., Gr.1, QTC Stradbroke H., Gr.1, VRC Turnbull S., Gr.2, MVRC Stanley Wootton S., Gr.2, STC Canterbury S., Gr.2, 1200m-in track record time, 2d AJC Epsom H., Gr.1, Doncaster H., Gr.1, BATC Doomben Ten Thousand H., Gr.1-twice, STC Theo Marks H., Gr.2, 3d MVRC WS Cox P., Gr.1, AJC Queen Elizabeth S., Gr.1, George Main S., Gr.1, VRC Newmarket H., Gr.1, BATC Doomben Cup, Gr.1, AJC Expressway S., Gr.2. ZYDECO (Zabeel). 2 wins at 1600m, 2000m, A$423,315, VRC Wakeful S., Gr.2, 2d VRC Oaks, Gr.1, 3d MRC Thousand Guineas, Gr.1. ALL ARCHIE (Archregent). 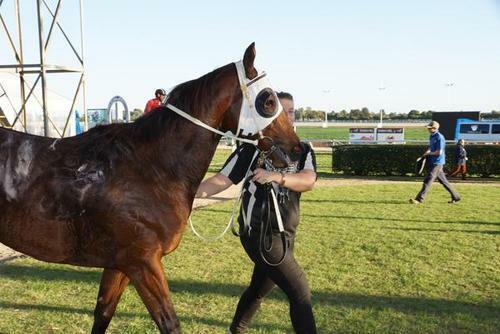 14 wins-2 at 2-to 1200m, A$417,770, AJC Challenge S., Gr.2, Royal Sovereign S., Gr.3, Liverpool City Cup, Gr.3-twice, City Tatt's RC Lightning H., L, AJC Chisholm Welter H., Stanley Wootton Welter H., STC BMW Australia Welter H., G & I Daly H., 2d AJC Expressway S., Gr.2, STC Canterbury S., Gr.2, AJC Shorts H., L, NSW Tatt's RC Carrington S., L-twice, 3d STC Missile S., Gr.3. All Mighty Prince (Mighty Avalanche). 9 wins to 1550m, A$172,110, AJC Divide and Rule H., BATC Club Managers Association H., STC Lunar Park H., TRC Northern Territory H., 2d TRC Thomas Lyons S., L, 3d TTC Newmarket H., L-twice. All Stormy (Storm at Sea). 7 wins. See above. Race Record: 19 Starts 7-3-1 A$151,840. 7 wins to 1200m, A$151,840, to 2014-15, 2d Canberra RC Camarena H., 3d VRC AR Creswick Series H., 4th Scone RC Ortensia S., L.